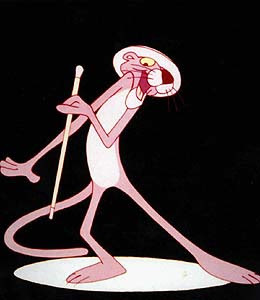 The Pink Panther as a cartoon appeared by chance. There was a movie called "The Pink Panther", by Blake Edwards, released March 20 1963. 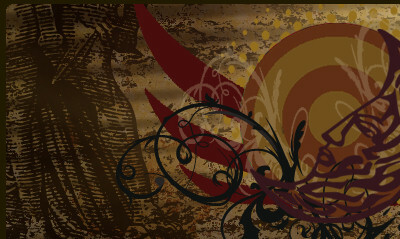 They needed an animation for illustrating the credits at the beginning of the film. So Edwards called Friz Freleng (the creator of Bugs Bunny) for making a cartoon that may be fun, that doesn't speak, and be of pink color. The character that was created for that opening sequence was so eye-catching that appeared in "The Times" cover. The Pink Panther, with some aristocratic look and some pop-art style, had great possibilities. So the producers thought in doing a cartoon movie, independently from the movie. So they did an animation short film. Its star was the Pink Panther, and that same year it won an Oscar for the best animation short. With this short film started the series of the Pink Panther. Movies were done, comics, merchandising of all kinds... that is still alive even nowadays. 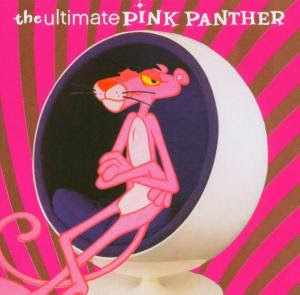 The music of the Pink Panther was done by Henry Mancini (the composer of "Moon River" of "Breakdast at Tiffany's"), and he won a Grammy with this. The name of the Pink Panther comes from the name of the diamond that was stolen in the film, where Peter Sellers played the role of Inspector Clouseau. Clouseau also appears in the Pink Panther cartoons. The Pink Panther also has its footprints in the Hollywood Walk Of Fame. Its star was given in 1999. 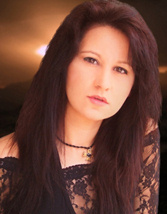 Although the character is mute, it talks in two chapters of the series. The secret of the success of the Pink Panther character is due to the aristocratic and elegant personality, associated with the 60s and the pop-art style. The Pink Panther is a British gentleman. Intelligent, methodical, smart, fun, sometimes similar to the Charles Chaplin's Charlotte, and without a doubt, these characteristics have captivated the public for decades. The chic pink of the Pink Panther is a trend from time to time. How would you design a PP logo? It depends on what is the logo for, but Pink Panther can be very fun for this. For example, for a restaurant, Pink Panther may carry a dish of spaghetti and the first letter could be a spaghetti, and that could be very funny. 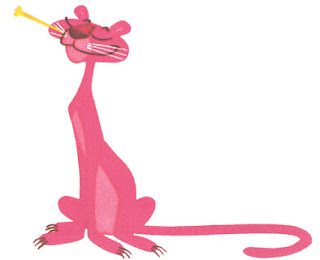 If it's a logo for a painter, Pink Panther may be using a brush to paint the name. And things like that, it may be very fun.